Deconstructing the writing, the familiar fish out of water story/romantic comedy is an impressively-structured, deceptively simple specimen of screenwriting. 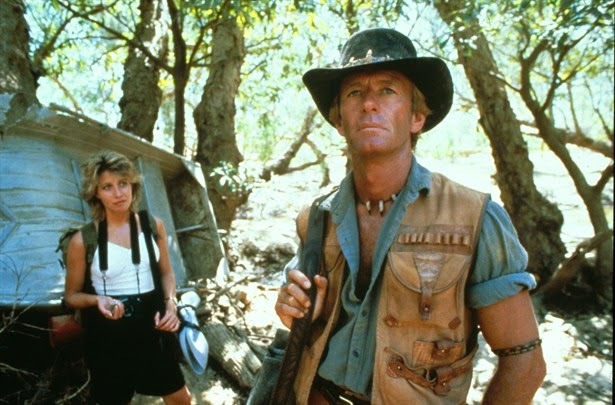 Within the first minute we meet NYC journalist Sue Charlton (Kozlowski) as she gets a phone call about the mysterious Aussie who claims to have wrestled a crocodile in the outback after his boat was attacked. And before the second minute has gone by Sue is on a plane and landing in Australia. The first half of the film cleverly introduces us to the wayward idiosyncrasies of the outback Aussie way of life, first through the affable guide played by Walter Reilly, then Mick Dundee himself (the interminably charming Paul Hogan). Themes of environmental responsibility and spiritual connection with nature barely existent in American culture emerges from fun set pieces along the way – some corny, some fun, some effectively romantic. As a female journalist Sue’s already proved herself in her male-dominated industry and thus as an alien to the outback way of life she’s keen to prove her own independence. She succeeds, but at every turn she reluctantly feels like ‘Jane’ in a Tarzan film. While it’s Paul Hogan’s film, Linda Kozlowski’s performance is equally impressive. She immediately exudes confidence and, the famous thong shot notwithstanding, becomes even more sexier without the need to show skin. The craftsmanship in the screenwriting thus becomes completely invisible through the natural performances and workmanlike direction. Like clockwork the film shifts at the midpoint to New York City, reversing roles of Mick and Sue. The intimidating action of the Big Apple becomes the alien environment for Mick and a whole new set of fish out of water gags are born. That said, the jokes in New York sadly have to rely on stereotypes, racial and homophobic and feel more worn out than charming these many years later. The picture moves into full on romantic comedy mode charting a course of courtship, then betrayal and breakup before the film’s rousing finale of reconciliation in the subway underground. The film freezes and fades to black at its most triumphant moment – an anachronism of 80’s cinema we’d never see today. But even with today’s eyes the moment where Mick climbs over the heads of his fellow passengers to get to the woman he loves is a great piece of romantic cinema. Peter Best’s pulsing music effectively drives the scene and is in fact the glue which binds the entire film. The Dundee sequel, also included on the new Paramount Blu-Ray double disc set, is considerably less inspired. Since all has already been revealed for both characters, the only story left to tell is a contrived drug dealer action plot featuring more racially stereotypical baddies.